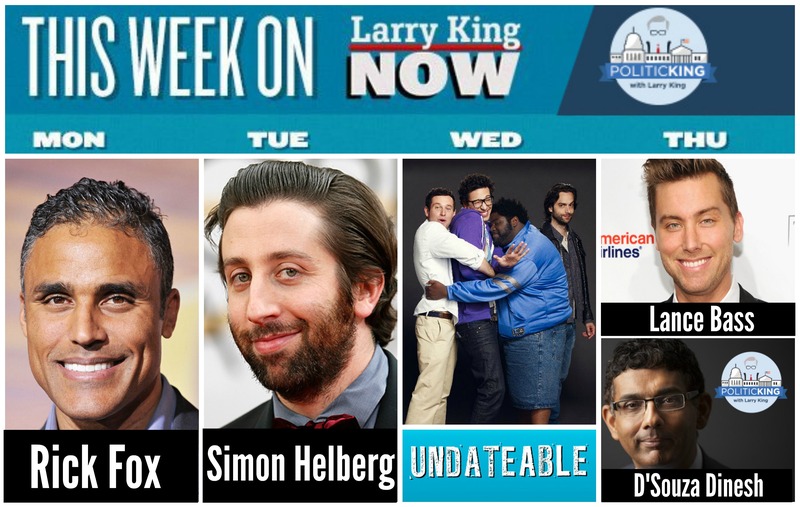 Mark your calendars for an exciting new lineup of“Larry King Now” guests including Rick Fox, Simon Helberg, Lance Bass & "Undateable" actors Brent Morin, Chris D'Elia and Ron Funches! And be sure to tune in Thursday for an all new“PoliticKING“ episode with D'Souza Dinesh! Don’t forget *NEW* episodes of“Larry King Now” & “PoliticKING“ are posted at 5PM ET - but you can watch them after they premiere online anytime on Ora TV & Hulu. And if you want to know more about all the ways you can watch new episodes online, on your tablet or even TV – be sure to check out our “About” page for more info!